Above clip (approx. 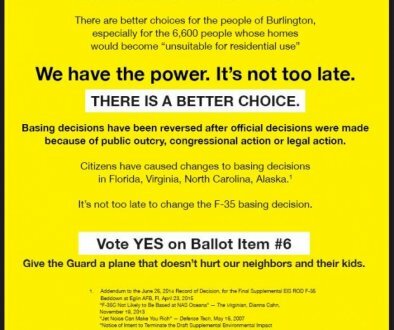 3 1/2 minutes) from when the Burlington City Council refused to limit aircraft noise at the airport, thereby clearing the way for the basing process to continue. Councilor Joan Shannon changed the meeting’s rules at the last minute, disallowing anyone who had ever spoken before on the issue to speak at that meeting (even though two weeks earlier she had promised everyone they would be able to speak). Therefore the people with the most knowledge, including our lawyer, were given no opportunity to refute the misinformation from the proponents. Doug Dunbebin, a former city councilor himself, broadcasted the recorded sound of the F35s to the council. You can hear Councilor Shannon in the background screaming at him and pounding her gavel.